We're going to run our monthly national poll this weekend, even though it's only been three weeks since the last one. -Outside the box questions. Last month we asked about whether people thought ACORN stole the election. In the past we've asked about things like whether the Government should stay out of Medicare and whether people think Obama is the anti-Christ. We like to get a few of that type of question on every survey. -The 4th Republican. We'll continue to take a monthly look at Mike Huckabee (which should be very interesting this week), Sarah Palin, and Mitt Romney and we've been switching up the fourth Republican on a month to month basis. I'll take nominations for the next 24 hours and then let you vote on it- anyone but Ron Paul, since we did him on the last poll. There is no doubt Harry Reid is in a pretty precarious position for reelection next year, but his situation may not be quite as bad as recent polling suggests. That's because Nevada was the most poorly polled swing state in 2008 and the error all skewed in a Republican direction. 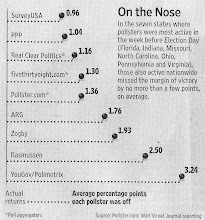 Only one pollster (congratulations AP!) ever showed Obama up by his 12 point margin of victory. Only two others (Zogby and Suffolk) even came within four points of getting Obama's margin right and most (including us) were off by 7-8 points. I don't know if any of them have changed anything about their Nevada polling after last year, but if not it's possible that Democratic performance in the state is still being shortchanged by the polls. Nevada is the only closely contested state I can think of last year where the pollsters were not only pretty universally off, but also pretty universally all off in the same direction. When we went back after the election to see where we went wrong it seemed like the culprit was significantly under measuring Obama's share of the Hispanic vote. Nevada is also one of the fastest growing states in the country and that could trip up pollsters as well, especially ones like us who sample based on past voting history. Just something to keep in mind on the Reid polling. Earlier this month Republicans won the contests for Governor of New Jersey and Virginia, thanks in large part to overwhelming margins of victory among independents. The one exception is the Wisconsin Senate race where Russ Feingold leads with independents against all three of the Republicans we tested against him. That said, there's no doubt it will be a brutal year for Democrats if they can't perform better with independent voters, and in the month following losses in New Jersey and Virginia there's no indication they're getting it turned around. The top candidates to be the next Governor of Wisconsin are relatively unknown, and that makes the race to replace Jim Doyle a tossup. Tom Barrett and Scott Walker are tied at 40, while Barrett leads Mark Neumann 41-39 and Tommy Thompson 46-41. A plurality of voters have no opinion one way or the other about Barrett, Walker, or Neumann. Walker is the best known with 30% of voters holding a favorable opinion of him, 25% seeing him unfavorably, and 44% having no opinion. Next is Barrett, whom 31% have a positive view of to 21% negative and 48% without an opinion. Neumann has the poorest numbers with 27% of voters seeing him unfavorably to 16% positive and 57% with no opinion. Although we didn't ask a direct horse race question on the primary the fact that 60% of Republicans have a favorable opinion of Walker and only 28% do of Neumann gives you a pretty good idea of where that race stands for the time being. The Gubernatorial numbers on this poll are further indication that Tommy Thompson's best next political move may be running for Mayor of Elroy. He does the worst of this Republican trio against Barrett, probably owing to the fact that 45% of the state has a negative opinion of him with only 38% seeing him positively. Clearly he has lost much of the appeal that got him elected to four terms as Governor. These numbers provide further confirmation that Jim Doyle's retirement is a very good thing for Democratic hopes of keeping the Governor's office. On our June poll of Wisconsin he trailed Walker 48-40 and Neumann 42-41. Given how much better Wisconsin voters will know these candidates in a year than they do now it's impossible at this point to say how the race will play out but it's clear that Republicans do have an opportunity to win this one back, and that it's likely to be a close contest. -Delaware. Most polling this year had shown Mike Castle in the lead but last week Susquehanna came out with one showing Beau Biden on top. Is the health care issue really hurting Castle? -Georgia. Said it before, will say it again, if there is a sleeper Republican seat where Democrats might have a better opportunity than they realize it could be Johnny Isakson's. We showed him with an approval rating in the 30s last November. It also wouldn't be unprecedented for Georgia to provide a late breaking opportunity for Democrats- same thing happened last year. In the current political climate it's hard to see a Dem being competitive there but who knows about a year from now. -Illinois Primary. Barely two months away and there are interesting contests in both parties for Governor and the Senate. I'm most interested in the Republican Senate primary- are attacks on Mark Kirk's moderation giving Patrick Hughes any traction? And of course there are a couple hot races on the Democratic side. -South Carolina. Really interested to see if Mark Sanford's finally below 30. Interested to see if Lindsey Graham has Olympia Snowe style approval ratings- more popular with Democrats than Republicans. And of course they have Gubernatorial and Senate races next year. Those are your choices, voting is open until Monday morning and with that I am off to Grandmother's in South Carolina where three days of local flavor will doubtless better qualify me to poll the state should it be this week's winner. With that small swath of the electorate that is persuadable though it's clear that the economy and jobs is going to be the key. 56% of those voters name that as their top issue, compared to 48% of the population as a whole. These folks are not that interested in education or health care or taxes, all of which poll lower with them than voters overall. These folks don't really care what the economists tell them about whether things are getting better. They need to feel it in their every day lives. If they do feel that things are better, they're going to vote Democratic next fall and things like health care and Mike Easley's legal issues and Bev Perdue's unpopularity aren't going to matter. And if they don't think things are getting better they're going to vote Republican because it affords an opportunity for change, just as they went Democratic for the same reason in 2006 and 2008. With undecided voters next year it's going to be all about the economy. -In Arkansas a number of polls have shown Blanche Lincoln trailing Gilbert Baker by small margins. -In Colorado Jane Norton led Michael Bennet 45-36 in the only poll I've seen on that particular match up. Given that we had Bennet trailing Gubernatorial uber loser Bob Beauprez in August before he decided not to run I can believe it. -In Connecticut, Rob Simmons has led Chris Dodd in every poll since March. -In Delaware, Mike Castle has led Beau Biden in two of the last three polls, although Biden did have the upper hand in the most recent one. -In Illinois, an internal Democratic poll last week showed Mark Kirk with a small lead over Alexi Giannoulias. -In Nevada, it's seemed that Harry Reid trails pretty much anyone and everyone in the recent polling. -In New York, Kristen Gillibrand has trailed George Pataki and/or Rudy Giuliani in a variety of recent surveys. -In North Dakota a Zogby poll last week showed John Hoeven would start with a big lead if he got in against Byron Dorgan. -In Pennsylvania the polls have been a mixed bag but two of the last four I've seen had Pat Toomey leading Arlen Specter. -In Wisconsin we don't find that Russ Feingold is at much risk against Tommy Thompson but a University of Wisconsin poll earlier in the fall showed Thompson leading 42-39- largely because Feingold was getting just 61% of the Democratic vote. We had him at 88%. I think Republicans do have a pretty good chance based on the current conditions in seven of these races: Arkansas, Colorado, Connecticut, Delaware, Illinois, Nevada, and Pennsylvania. In three of them their hopes are going to hinge on getting a single candidate in the race- Giuliani, Hoeven, Thompson- who hasn't shown a whole lot of interest in it. And of course even if by some chance Republicans did manage to win all ten of these seats and hold on to open seats in Kentucky, Missouri, New Hampshire, and Ohio that looks like toss ups Vice President Biden would still be breaking the ties. -Get Mitch Daniels to run against Evan Bayh. I pick that example not because I think Bayh is unpopular but because every other Democratic seat not mentioned above is in a heavily blue state. The chances of everything coming together are probably less than 1%, but Republicans certainly could make a big dent next year and finish the job in 2012 when Democrats will have a lot more to defend. Nate Silver had a good post yesterday about how Barack Obama could probably get reelected with a lower approval rating if Sarah Palin was his opponent as opposed to say Mitt Romney in 2012. I completely agree. I looked at our last four 2012 polls and calculated the percentage of the vote Obama got among people who don't approve of him against Palin, Romney, and Mike Huckabee. Over the course of those surveys Obama averaged 9.5% against Palin with voters who fit that description while earning just 5% against both Huckabee and Romney. Using Nate's example of a 45% approval rating, and assuming that everyone who approves of him would vote for him, that would give Obama 50.2% of the popular vote against Palin but just 47.8% against Huckabee or Romney. In other words nominating Palin vs. nominating one of the other Republicans would be the difference between GOP victory and GOP defeat. Obviously things could change a lot between now and 2012 with the perceptions of all these politicians but for now it does look like Palin would hurt Republican hopes of taking back the White House. -It's a good thing for Democrats that Jim Doyle decided not to run for reelection. His approval rating is now down to 29% with 57% of voters in the state disapproving of him. When PPP looked at Doyle's standing in June his approval was 34%. As the New Jersey Governor's election showed, no matter how Democratic your state is you simply can't get reelected with these kinds of numbers. 58% of Democrats approve of Doyle, a poor standing compared to Russ Feingold's 78% and Herb Kohl's 73% within the party. But where his numbers really stand out as poor are with independents (22% approval) and Republicans (5% approval). -Kohl's approval rating is 45%, just as Feingold's was. Normally those numbers wouldn't be considered too great but in a time when voters are disgusted with all politicians and not too enamored with Democrats in particular that's not a bad showing- better than for most Senators we've polled on lately. -You know it's shaping up to be a good year for the GOP when it holds the lead on the generic Congressional ballot in Wisconsin. 43% of voters in the state say they plan to vote Republican for Congress next year with 41% going for the Democrats. The key to the Republican lead is a 39-24 advantage with independents, mirroring the trend we're finding in almost every state. Voters in Wisconsin have a pretty dim view of both the Democrats and the Republicans in Congress. 36% have a favorable opinion of the Dems to 50% unfavorable. For the GOP it's 30% favorable and 51% unfavorable. The reason Republicans lead on the generic ballot despite being less popular than the Democrats is that they have a 63-12 edge with voters who have an unfavorable opinion of both Congressional Democrats and Congressional Republicans- a group that accounts for 14% of the electorate. When you're unhappy with everyone you'll tend to vote for the party out of power. When talking about the decline in Barack Obama's approval numbers the media usually focuses on independents, or whether he's losing his base. The biggest reason his numbers are going down right now though is not related to either of those things- it's because he's losing whatever small amount of bipartisan appeal he once had. On our national survey in June Obama had an 82% approval rating with Democrats. Now it's 83%. He had a 46% approval rating with independents. Now it's 47%. No real change on either of those fronts. But with Republicans he's dropped from an 18% mark to just 10%. That shift is what put his approval rating below 50%- he's gone from a small amount of crossover support to a very small amount of crossover supports. Yesterday I wrote about how Mitt Romney's overall favorability numbers with Republicans were crashing. Let's look at a more specific swath of the GOP electorate though- those voters who think that the party's too conservative. It's not a huge group but it's the one most likely to cross over and vote for Obama in 2012 and thus Republicans really need to hold onto them if they want to win the next Presidential election. Sarah Palin is not the answer with those folks. 43% of them have a positive opinion of her but 37% view her negatively for a +6 net favorability rating. Mike Huckabee comes out better with 44% viewing him favorably and 16% having an unfavorable take, for a +28 net ratio. And the most popular with this group? None other than Mitt Romney at a 51/16 favorability spread for a net +35. So the guy the Republican rank and file likes the least is the one that the weakest group of Republican voters like the most. Those are the sorts of internal disparities the GOP is going to have to work out if it wants to win the next time around. Barack Obama is struggling in Wisconsin, with voters evenly divided on the job he's doing as President. 47% approve and 47% disapprove. He won the state 56-42 last year. Obama hasn't lost much support with his own party- 90% of Democrats give him good marks with only 6% disapproving. But he has virtually no crossover support from Republicans - 91% disapprove of how he's doing and only 4% approve. Independents split against him by a 50/42 margin. Health care is certainly one factor that could be hurting his numbers. 52% of voters in the state say they're opposed to Obama's plan with only 37% in support. Independents are opposed 58/31 and Republicans (95%) are considerably more unified in their opposition than Democrats are in their support (74%). Obama generally seems to be having problems in the Midwest. A Des Moines Register poll over the weekend showed Obama's approval rating there dropping to 49%. A Quinnipiac poll a few weeks ago in Ohio showed 50% of voters disapproving of him there to just 45% approval. A recent Rasmussen survey in Minnesota found him only slightly in positive territory, 51/48. He won all three of those states last year by margins ranging from 4 points in Ohio to 10 points in Iowa and Minnesota. 37% of Wisconsin voters are independents to 34% Democrats in this poll, and that could explain part of Obama's unusually large drop off. 92% of Democrats who voted for Obama still approve of the job he's doing, but only 74% of independent Obama voters say they think he's doing a good job. Obama's approval is more likely to drop even in a state where he did well at the polls if there are more independents than Democrats because they're less loyal to him even if he received their voters last year. Obama's ease in winning typically competitive midwestern states like Wisconsin, Iowa, Minnesota, and Michigan last year freed up the resources for him to win surprise victories in states like North Carolina and Indiana. He's going to need to bring up his poll numbers in the region to allow a repeat performance the next time around. When Tommy Thompson made noises last week about possibly challenging Russ Feingold for the Senate next year there was a bit of a 'here we go again' feeling in Democratic circles. The party is already having to vigorously defend a lot of its seats, and Wisconsin would have joined states like Illinois and Connecticut in the category of places where a couple years ago at this time they would have felt pretty safe. A former four term Governor would seem like the best candidate Republicans could possibly put forward except for one catch- Wisconsin voters don't really like him anymore. 45% have an unfavorable opinion of him to just 38% who view Thompson positively. The upshot of that is Feingold leads Thompson 50-41 in a hypothetical contest. Feingold leads 47-41 with independents, a rarity for Democrats anywhere these days, and wins 88% of his party's vote while only 82% of Republicans commit to voting for Thompson. If you lead with independents and have your party more unified around you and you're a Democratic Senator in a blue state you don't have much to worry about. A Thompson candidacy seems like a long shot anyway. Feingold leads little known Republican candidates Dave Westlake and Terrence Wall by margins of 47-32 and 48-34 respectively. Each of them has only 2% positive statewide name recognition. As for Feingold 45% of voters approve of the job he's doing in the Senate with 38% disapproving. He's not very popular with Republicans, nor has he ever been, but Democrats give him strong reviews and he's at 43/39 with independents. Democrats have work to do in a lot of places on the Senate front next year, but Thompson or no Thompson it doesn't appear Wisconsin will be one of them. First Read, via Political Wire, asks why Republicans are so fixated on Ronald Reagan. It may be because Reagan is by far our most popular recent President. We've only done that poll in two states- Virginia and North Carolina- but I think the results would be similar elsewhere. In Virginia 44% of respondents said Reagan was their favorite since 1980 to 23% for Barack Obama and 21% for Bill Clinton. Reagan also was tops with 44% of voters in North Carolina to 29 for Obama and 18% for Clinton. There were a couple interesting things within the numbers in those places. Reagan finished first in every age group in both states (he was tied with Clinton for most popular with the under 30 crowd in North Carolina.) So even with a lot of voters who are barely old enough to remember Reagan, much less have voted for him, he comes out as the most popular. Also, his numbers with independents are even better than the overall ones- 57% in Virginia and 48% in North Carolina said he was their favorite former President. Let's be honest- Ronald Reagan is probably the most recent Republican politician that voters nationally remember fondly- or at least think they remember fondly. He may be 21 years out of office but the Reagan mystique is still alive and if Republicans can make people think of him as the face of the party instead of the Bushes that is a good strategy for them. They don't remember the specifics of the Reagan years, just that everything seemed better then, whether it actually was or not. Mitt Romney is considerably less popular with Republican voters than Sarah Palin or Mike Huckabee, and that problem has become worse for him over the course of the year. On our monthly 2012 polls, which began in April, an average of 74% of Republicans have held a favorable opinion of Palin to 66% for Huckabee and 56% for Romney. The gap hasn't always been that wide though. On the first three iterations of this survey, from April to June, Palin averaged a 76% favorability number to 67% for Huckabee and 63% for Romney. On the last three runs, from September to November, Palin has averaged 72% to 64% for Huckabee and just 51% for Romney. Romney polled in the 60s on the first three polls but has not reached that threshold since and now for the first time he's below 50% with the party base. I don't have any theories to explain Romney's popularity slide with Republican voters but it certainly bodes ominous for his 2012 nomination prospects if he can't get it turned around. North Carolina voters don't have much trust in their politicians, regardless of party. 45% think that the Democrats in state government are corrupt to 27% who think they are not. The Republicans aren't a whole lot better with 37% thinking they're corrupt to just 28% who believe they are not. There are a lot more undecideds about the Republicans probably due to their out of power status. It's predictable that Democratic voters think Republicans are corrupt and vice versa, but there's actually a decent number of folks who think their own parties are as well. 26% of Democrats think their own party is corrupt and 25% of Republicans say the same of theirs. These numbers are a good indication of why corruption hasn't been a particularly effective electoral issue for Republicans in 2006 and 2008 despite the number of Democratic scandals. The voters don't really trust them any more than they do the Democrats. North Carolinians also think that corruption in the state is on the rise. 55% believe there is more of it going on in state government than there was 25 years ago with only 8% feeling it's on the decline. Even compared to just five years ago 43% think it's becoming more common to 9% who believe it's become less so. We've talked frequently about how North Carolina gives its politicians some of the lowest approval ratings of any state in the country- these findings may at least be a start to explaining some of that- elected officials just haven't earned a whole lot of trust from their constituents. The political repercussions for Congressional Democrats of not passing a health care bill could be severe. Our newest national survey finds that Democrats lead 46-38 on the generic Congressional ballot. But asked how they would vote if no health care bill is passed respondents split 40-40 between saying they would vote Democratic or Republican in next year's election. In some sense the Democrats may be in a damned if you don't or damned if you do position on health care. Asked how they would vote for Congress next year if a health care bill with a public option is passed respondents said they would go Democratic by a 46-41 margin, still more narrow than before any hypotheticals about health care outcomes were introduced into the questions. -There is a price to pay with independents if a strong health care bill is passed. Democrats lead 37-30 with them in general on the generic ballot, but they say they'll vote 44-37 for the GOP if a bill with a public option makes it through. Clearly some independents are sitting on the fence waiting to see what happens with health care before they decide how to vote next year and Democrats could push them toward the Republican side by passing a bill without bipartisan support. -That said, the price to pay with those independents is not nearly as bad as the damage Democrats would do with their base by not passing a health care bill. Democrats get 86% with their own party on the generic ballot if a bill with a public option passes. They get 84% before health care is even mentioned. They get just 75% without a health care bill. They have to get something done in order to keep the party's rank and file voters in line for next year. What's the big take away? The political damage for Democrats of passing a public option is not as bad as the damage from doing nothing. But they would still be better off passing something that's not perfect than passing nothing at all. Most voters aren't following this debate really closely and don't understand the nuances of it all. At the end of the day voters are likely to see this as either a bill was passed or it was not. In some sense that should get the Blanche Lincolns and Mary Landrieus of the world in line- they're probably going to face just as much trouble back home whether there's a public option in there or not. But failing that Democrats would still be better off, at least for next year's election, with a weaker bill than no bill at all. -Does Barack Obama have a midwestern problem? 52% of voters there disapproved of him on our national poll this week, by far his worst performance in any region. A new Des Moines Register poll this morning finds him under 50 in Iowa, as did Quinnipiac in Ohio last week. We have a Wisconsin poll in the field this weekend and it looks like Obama will almost certainly be under 50% there, and possibly even in the red. Certainly the region has been hit unusually hard by the economic downturn, and a year after his election some of the blame seems to be shifting from Bush to Obama. -Speaking of the Wisconsin poll, the impetus for it was to see what impact a Tommy Thompson candidacy might have on the races for Governor and Senate. Somewhat to my surprise he is no longer a particularly popular figure in the state. He would be competitive in a race for either of those offices, but he looks weaker than Scott Walker as a GOP gubernatorial candidate and he doesn't appear to be as popular as Russ Feingold. That said in this political climate- as we saw in Missouri last week- you can suffer from a popularity gap and still poll competitively. Expect Senate numbers Tuesday, approval numbers Wednesday, Governor numbers Friday. Also tomorrow we're going to have our national look at the Congressional picture out as well as some stuff on corruption in North Carolina. -Finally it's time to take another round of suggestions for where we poll- because of the holiday this will be fielded Monday-Wednesday the week after Thanksgiving with releases starting Thursday of that week. -I generally don't like combined primary/general polls- so if a primary is in the next six months like Illinois or Texas we would only do a poll of likely primary voters or of likely general voters. If it's not until next fall like Florida I guess we can still do a combined one of both. Leave your suggestions in the comments and I'll pick some finalists and let you vote from Wednesday through Sunday. A majority of voters under the age of 65 in North Carolina like the job Barack Obama's doing as President. They say they'll vote for an unnamed Democrat by a 42-41 margin over Richard Burr, plan to support Democrats by a 47-41 spread for the legislature and also plan to go Democratic 47-42 for Congress. Despite all that Obama's overall approval rating is only 47%, and voters in the state (albeit by a close margin) are currently planning to reelect Burr and vote Republican for both the legislature and Congress. Why the disconnect? Democrats in the state are currently having a huge senior problem. 57% of them disapprove of Obama with only 35% giving him good reviews. They plan to reelect Burr by a 55-31 margin and they plan to vote 56-33 GOP for the legislature and 56-32 for Congress. It's not unusual for older voters in North Carolina to vote more conservative than the state as a whole- they gave John McCain his largest amount of support last year- but this is an unusually large disconnect. Health care definitely seems to be the driving force on this. 65% of seniors in North Carolina say they're opposed to Obama on the issue with just 26% supportive. What makes this a particularly acute problem for Democrats is that voters over 65 are likely to make up a much larger portion of the electorate in 2010 than they did in 2008. Seniors vote more consistently than younger voters, and early indications from races in New Jersey and Virginia this year are that the Obama wave voters can't be counted on to come back out for an off year election. Democrats in North Carolina next year are going to have to find a better way to get those newer voters out to the polls than their peers in other states- but they're also going to have to find a better way to connect with older voters if they're going to keep what they have. This is going to be one of the biggest trends to watch in North Carolina next year. Could John Ashcroft make a return to public office in the future, perhaps as a candidate for the Senate or Governor in 2012? It seems like a far fetched possibility but Missouri voters may be somewhat open to it. Ashcroft came out on top of our newest poll asking folks in the state who their favorite Governor of the last 25 years is. 35% of respondents picked Ashcroft, allowing him to narrowly edge out Mel Carnahan with 32%. Ashcroft finished first among Republican voters with 58%, while Carnahan likewise finished first with Democrats with 58%. Among independents Ashcroft edged Carnahan 40-30. Family names may loom large in next year's Senate race with the daughter of a former Governor running on the Democratic side against the father of a former Governor on the Republican side. If legacies become an important factor in the contest it appears that will be to Robin Carnahan's advantage, as Matt Blunt is the state's least popular Governor of the last 25 years, the choice of 29% of respondents. Finishing second on that front is Bob Holden and third is Ashcroft. Democrats pick Blunt as their least favorite by a 45-35 margin over Ashcroft and independent choose him by a 28-25 spread of Holden. Republicans split their 'least favorite' choices evenly between Carnahan and Holden. Matt Blunt clearly was not a popular Governor, and that could hurt his father next year. Carnahan's father on the other hand seems to be generally well remembered. It will be interesting to see how much those things matter next year in a race that's likely to be closely contested. Jay Nixon did not receive much support for either most popular or least popular, an indication he hasn't made a strong impression yet on voters in the state one way or the other. Barack Obama's still leading all of his top potential opponents for 2012, but with his approval rating nationally below 50% for the first time his margins against a couple of them have dropped below what he won against John McCain last fall. For the eighth month in a row Mike Huckabee comes the closest to Obama of the leading GOP hopefuls but for the first time he has company in Mitt Romney. Both of them trail the President by five points, Huckabee by a 49-44 margin and Romney by a 48-43 spread. The key to Huckabee's strong performance is that he does the best of the Republican candidates we tested with the party base, taking 87% of the GOP vote in a head to head with Obama. There is some bad news for the former Arkansas Governor in the poll too though, as his favorability has moved slightly into negative territory by a 37/36 margin. This is the first time Huckabee has been in the red on that front. Romney's strength in his best performance yet against Obama is with independents. While the other GOP candidates trail by 7-9 points with them Romney is at just a 44-42 deficit. His favorability numbers in the poll are less than impressive though, with 30% of voters holding a positive opinion of him to 39% negative. That has a lot to do with fewer than 50% of Republican voters saying they have favorable opinion of him. Sarah Palin may be getting at least a slight book bounce, as her favorability numbers are the best they've been since August and her margin relative to Obama is the smallest it's been since July. Neither of those things are necessarily saying much though- 49% of Americans have an unfavorable opinion of her to 40% favorable and she continues to trail the President 51-43. New to the poll this month is Ron Paul. He is more well liked by Democrats (18%) than his fellow Republicans who sport 13-14% favorability numbers with the opposing party. At the same time he is easily the least popular within his own party, as 25% of Republican voters have an unfavorable opinion of him to 11-19% for the other three. He trails Obama 46-38. What does this all mean for Obama? He is in a slightly weaker position than he was a year ago, with his 49% approval rating running four points below his share of the popular vote last year and his leads over Huckabee and Romney a bit smaller than his winning margin over John McCain. At the same time he's already pretty much bottomed out with GOP voters so as is often the case in politics his long term prognosis is going to depend on keeping the independents he won over last fall and ensuring that he continues to fire up the Democratic base the way he did in 2008. -Jay Nixon. It's been a pretty successful first year for the state's new Governor. 42% of voters approve of the job he's doing to 25% disapproving. In a time when the popularity of many chief executives across the country is tanking, those are very solid numbers. Nixon is one of only four Governors PPP has polled on all year with a disapproval rating under 30% (the others being Jack Markell of Delaware, Mike Beebe of Arkansas, and Pat Quinn of Illinois.) The 33% of voters with no opinion of him is unusually high though, an indication that he may need to do more to step up his visibility across the state. -Kit Bond. Over the course of PPP's last three Missouri polls Bond's approval rating has gone from 44/43 to 57/27 and now down to 41/34. What explains the wild fluctuation? The poll showing Bond with strong numbers was taken right after his retirement announcement, an event that clearly gave him a strong but temporary bounce. His approval's gone back to what it was last summer but his disapproval remains lower. That's largely because of a difference in his numbers among Democrats compared to last summer- his approval with them remains the same but his disapproval has gone from 53% to 43% with 'no opinion' going from 22% to 31%. That may be some continued post-retirement civility: why bother disapproving of someone on the way out? -Claire McCaskill. McCaskill's spent less time in statewide office than Nixon or Bond, but voters in the state have the strongest opinions about her with 45% disapproving of her performance and 42% approving. Those actually aren't particularly bad approval numbers for a Democratic Senator in what is proving to be a very difficult end of the year for the party. The evenly divided opinions about her though suggest Missouri could have yet another highly competitive Senate contest in 2012, further enhancing its reputation as one of the country's foremost battleground states. Losing NY-23 candidate Doug Hoffman became the latest in an increasingly long line of conservative politicians to blame his problems on ACORN yesterday despite the complete lack of evidence the organization played any role in his defeat. The Republican base is with him though. PPP's newest national survey finds that a 52% majority of GOP voters nationally think that ACORN stole the Presidential election for Barack Obama last year, with only 27% granting that he won it legitimately. Clearly the ACORN card really is an effective one to play with the voters who will decide whether Hoffman gets to be the Republican nominee in a possible repeat bid in 2010. Overall 62% of Americans think Obama legitimately won the election to only 26% who think ACORN stole it for him, as few Democrats or independents buy into that line of thinking. The organization is generally unpopular though, with only 11% of voters viewing it favorably to 53% with an unfavorable opinion and 36% without one. The only politician we've polled on this year with comparably bad favorability numbers is John Edwards. The constant harping on ACORN by Republican politicians may sound nutso in some circles, but it certainly has hurt the organization's image and it looks like the anti-ACORN message may resonate with a decent portion of the American electorate. ACORN is probably well overdue for a rebranding. For our monthly look at Barack Obama's approval rating nationally we decided to have voters give him a letter grade in addition to a straight up or down vote on his performance. Overall Obama's 'GPA' comes out to a 2.1, somewhere between a C and a C+. That's a middle ground grade, but when it comes to individual evaluations of Obama there is little of that middle ground within the American electorate. A majority of voters give him either the highest or lowest grade, with 30% rating him as an A and 26% giving him an F. Even though his numbers average out to a C only 7% actually give him that grade, with the remaining 37% of the country split almost evenly between B's and D's. By and large voters either really like or really dislike Obama. Obama's approval this month slips below 50% for the first time, with 49% of voters giving him good marks for his mark and 46% disapproving. Obama's numbers with Democrats and independents are almost identical to what they were in October, but he's at a new low with Republicans as 87% now disapprove of his work with only 10% in support. That's down from a 13/82 spread a month ago. Opposition to Obama on health care has reached its highest level now as well, with a majority of Americans now saying for the first time that they're against his plan. While support has remained steady with Democrats, Republicans and independents are becoming more firm in their push back. 92% of GOP voters say no, up from 84% a month ago, as do 58% of independents, up from 47% in October. It's interesting to note that even as independent voters have hardened their opposition on health care their overall support for Obama remains unchanged. Overall 52% of voters say they're opposed to Obama on health care with 40% supportive. How is all of this affecting Obama's long term reelection prospects? We'll have our newest round of 2012 polling out tomorrow. Chuck Purgason is a long, longggggggggggg shot for the Senate nomination in Missouri but there is one thing he has on his side: Congressional Republicans are not that popular even with the GOP base in the state. Only 44% have a favorable opinion of them with 38% seeing them unfavorably. If they continue to become more unpopular and Purgason can effectively frame Blunt as emblematic of the problem that may be his one and only shot. If you look at where Blunt and Purgason are drawing their support right now, it looks to be much more a pro-Washington vs. anti-Washington thing than a moderate vs. conservative thing. Among conservatives Blunt leads 55-13 and with moderates he's up 46-23, an indication that Purgason is not picking up much of his support from people concerned about Blunt's ideological purity- perhaps the opposite actually, that Purgason is benefiting from people who think Blunt is too conservative. There's a bigger divided based on how people feel about Congressional Republicans. Those who like them give Blunt a 62-13 advantage. Those who dislike them give him only a 47-20 lead. If there is a winning message for Purgason that's it-how are we going to clean up the mess in Washington with someone who's been causing the problem for the last 13 years? There is a movement among some North Carolina Republicans to close the party's primaries to independents because they think allowing them to vote results in excessively moderate candidates being nominated. But is that claim really true? Independents are often thought of as being straight down the middle voters who split their tickets and shift from party to party on an election by election basis. Even within the ranks of independents there are few voters who actually fit that stereotype- most lean strongly toward one party or the other but just don't feel like identifying themselves with one. In North Carolina our independents are a conservative leaning bunch. 49% are moderates but among the rest of the crew 41% are conservatives and just 10% are liberals. Let's take a closer look at the independent voters most likely to vote in Republican primaries though- those who disapprove of Barack Obama's job performance. Within that group 65% are conservatives and 34% are moderates. The ideological identification of Republican voters in the state breaks down 71% conservatives and 27% moderates. Throw those Obama disapproving independents into that mix and you end up with a likely Republican primary electorate that's 69% conservatives and 29% moderates. When you actually look at the numbers the premise that allowing unaffiliateds to vote in Republican primaries gives moderates undue power is false. The independents who participate in GOP primaries are almost as conservative as registered Republican voters. It would seem this movement is being driven by emotions rather than facts. Beyond that I don't think the party's problem in recent elections has been the excess moderation of its candidates- quite the opposite actually- but allowing or not allowing unaffiliateds to vote in their primaries has no impact on that. It looks like North Carolina is headed for a pretty competitive election year in 2010. PPP's newest round of generic ballot polling for legislative and Congressional races in the state finds tight margins on both fronts. By a 45-44 spread voters say they plan to vote Republican for the legislature and by a nearly identical 45-43 margin they say they'll vote for GOP Congressional candidates. Republicans are polling closely in a state with a heavy Democratic registration advantage for two key reasons. The first is support from independents. They say they'll vote Republican for the legislature by a 48-27 margin and for Congress by a 48-29 margin. The second is that GOP voters are more unified than Democrats are. While 88% of Republicans commit to voting for their party's legislative candidates only 79% of Democrats do. On the federal level 90% of Republicans are on board with the party compared to 77% of Democrats. Conservative Democrats often swing close elections in North Carolina by whether they stick with their party or stray, and their current choices provide a prism into why the state looks so competitive right now. They're only committing to voting Democratic by a 48-42 margin for Congress and a 46-42 one for the Legislature. When you combine that kind of crossover support for Republicans with their current advantage with independents you have the right conditions for the GOP to have its best election cycle in the state in quite a long time. We'll see whether they can take advantage of it or not. Blanche Lincoln's approval rating in Arkansas' 2nd Congressional District, where Barack Obama had his strongest performance in the state last year, is just 27%. 55% of voters disapprove of the job she's doing. It's predictable that 70% of Republicans give her poor marks but more surprising is that independents break down 64/19 against her and even among Democrats just 43% give her good marks to 37% disapproving. In a pair of hypothetical 2010 contests we looked at Lincoln trails Gilbert Baker 43-38 and Stanley Reed 42-39, despite the relative anonymity of the Republican duo. 67% of voters have no opinion of Baker and 78% are ambivalent toward Reed. Certainly some of Lincoln's problems are due to the national political climate, which is largely beyond her control. 54% of voters in the district generally have an unfavorable opinion of the Democrats in Congress and 52% of them disapprove of Obama's job performance. Her poor numbers with Democrats are of her own doing though, and are considerably worse than those of Obama, Vic Snyder, and Mark Pryor. Few of the Democrats who dislike her will go so far as to vote Republican next year, but as we saw in Virginia and New Jersey this year they might not show up to vote for a candidate they're not enthusiastic about and that could have serious repercussions for the rest of the state's Congressional Democrats and not just Lincoln. It's hard to say what she should do to get on the path back to popularity though. 30% of Democrats in the district think she's too conservative but 49% of the independents think she's too liberal. Those are the two groups she needs to do a lot better with to win reelection, and it's not clear what she could do to appease both of them. To win next year Lincoln may need for her eventual Republican opponent to self destruct, which certainly would not be unprecedented. Tim Hutchinson's doing so provided Democrats one of their few bright spots on a dreary 2002 election night. When PPP polled the Missouri Senate race in January Robin Carnahan led by one point. Fast forward ten months and nothing has changed. Carnahan leads Roy Blunt 43-42. It's a good sign for Carnahan that her status hasn't worsened as things have gone sour in general for the Democratic Party over the course of 2009. That's a product of Carnahan and Blunt being more well known than your typical open seat candidates, particularly because of their family names, and probably also due to Blunt's being symbolic of a Congress that voters don't care for. You're definitely better off being a Jefferson City politician in 2010 than a Washington one. Voters in the state view Carnahan a good deal more favorably than Blunt. 40% have a positive opinion of her to 36% unfavorable, for a +4 net rating. Only 30% of voters see Blunt favorably with 38% looking at him negatively, for a -8 net rating. In a normal election year Carnahan would probably cruise to election given that divergence in the candidates' popularity. But 2010 is shaping up to be good for Republicans and Carnahan can't completely avoid that. 52% of voters in the state disapprove of the job Barack Obama is doing with only 43% giving him good marks. Also 58% of voters have an unfavorable opinion of the Democrats in Congress with only 27% seeing them positively. Those two findings are a good look into why Carnahan doesn't have a wider lead. Congressional Republicans are actually even more unpopular than Congressional Democrats in the state- 62% view them unfavorably. But among voters with a dim view of both parties- which accounts for 27% of the state- Blunt leads 59-22. Generally speaking when voters don't care for either party they'll vote for the one that's out of power because of the mentality that there's at least a prospect for things to change. State Senator Chuck Purgason is also running and trails Blunt 53-16 in the primary. Blunt is at no real risk of not winning the nomination, but the numbers do indicate he still has some work to do ingratiating himself with Republican voters. In a general election contest that will probably never happen Carnahan leads Purgason 42-35. There's no doubt this is going to be one of the top races in the country next year. Democrats will be playing a lot of defense nationally in 2010 but Carnahan is a superior candidate to Blunt and that makes this one of the best opportunities for the party to pick up something it doesn't currently hold. Should be an interesting one to watch. I was interested to see David Plouffe comment that the 2012 Republican Presidential nominee might come from outside the roster of the current top contenders. I don't know if it will or not, but I think for the GOP to win next time around it will have to be. Sarah Palin, Mitt Romney, and Mike Huckabee have all been through a national campaign now. They're relatively well known. And they just aren't that popular. On our last round of 2012 polling all three had favorabilities in the 30s- 36% for Palin, 34% for Romney, and 33% for Huckabee. And while Palin had the most admirers she also had by far the most detractors with 51% of the country holding an unfavorable opinion of her. Perhaps there's a way one of these folks can rebrand themselves to become more appealing but to me it looks more like Bob Dole in 1996 all over again- you nominate someone who's already proven to be a Presidential loser and you get results pretty similar to the last time around. All three of these folks reinforce the negative perceptions that much of the country holds about the Republican Party. The GOP needs a fresh face that challenges people's assumptions about who Republicans are and is visibly not just going to be George W. Bush under another name. I don't know who that person is, but he/she needs to emerge if the party is going to win back the White House in 2012. The Missouri Senate race, where we'll release numbers tomorrow, is a great prism into the current political climate. 44% of independents in the state have an unfavorable opinion of Roy Blunt to just 23% viewing him favorably. Robin Carnahan also has poor, but somewhat better, numbers with that group- 40% have an unfavorable opinion of her with 33% holding a positive take. The fact that both candidates are unpopular with independents is a clue to the enmity voters are feeling toward politicians of all stripes right now, but with Carnahan's net favorability with independents coming out at -7 to Blunt's -21 you would expect her to have a solid race in the horse race with that group, right? Wrong. Blunt leads 44-32 with independents even though only 23% like him. His vote share nearly doubles his favorability! This is another example of something I wrote about last weekend- voters who dislike both parties or in this case both politicians are leaning toward the party out of power because they at least see it as an alternative to the status quo. A big part of the Democratic message next year is going to have to be reminding voters why they hated the Republicans being in power so much and convincing them the alternative is worse. We'll release the second part of our Arkansas-2 poll tomorrow but here's the key finding: while 78% of Democrats in the district approve of the job Barack Obama is doing, 75% like Vic Snyder, and 61% like Mark Pryor only 43% express support for Blanche Lincoln. That's some pretty serious confirmation she has a base problem. We found that 30% of Democrats in the district think she's too conservative. I'm really not sure what Lincoln should do but I certainly don't envy her position. She's stuck between a rock and a hard place. Now it should be noted that despite Lincoln's 43% approval with Democrats she still pulled 71% of the vote in her party versus the Republicans we tested her against on this poll. But that's where I start to worry about the Creigh Deeds effect- if the base has so little enthusiasm for the top of the ticket is it even going to bother turning out next year? Her lack of popularity could be bad news for the rest of the Democratic delegation. Mike Beebe is incredibly well liked but also not likely to have a very competitive race so I'm not sure how much of a turnout driver that will be. It'll be interesting to see how this all plays out. We'll have the full Lincoln numbers tomorrow. Last year Republicans didn't even bother to run a candidate against Democratic Congressman Vic Snyder in Arkansas. Now with the political climate turning in the wrong direction for Democrats nationally, and particularly in the Natural State, it looks like he may be in for the toughest fight of his career to get reelected next year. Snyder's approval rating is now 42%, with 46% of voters in the district disapproving of him. He's at a solid 75% in his own party but with independents the spread is 30/56 and with Republicans it's just 12/75. A lot of Snyder's issues can probably be traced to overall feelings about his party. 54% of voters in the district disapprove of the job Congressional Democrats are doing, 52% disapprove of Barack Obama's job performance, and 50% express the feeling that Congressional Democrats are too liberal. Additionally 55% of voters say they're opposed to the health care bill the House passed last week with Snyder's support, including 91% of Republicans and 67% of independents. Snyder seems to be bearing the brunt of a lot of animosity toward national Democrats in his district. The practical implication of all this is that the district looks like a toss up for next year. In possible 2010 match ups Snyder leads Tim Griffin 44-43, Scott Wallace 44-42, and David Meeks 45-42. Those close margins come despite the fact that none of the Republican candidates are well known- 67% of voters have no opinion about Griffin, 75% say the same of Wallace, and 78% are ambivalent toward Meeks. The Republicans hold leads of 13-15 points among independent voters, continuing a trend being seen across the country this year that was particularly important in giving the GOP victories in races for Governor of New Jersey and Virginia. Certainly a lot can change between now and next November, and Snyder has shown resilience in bad election years for Democrats in the past. But we polled Arkansas-2 because we thought it would be a good test case for whether the political climate is so bad for Dems right now that districts that haven't been in the top tier of competitiveness for years might be in play, and it looks like the answer is yes. We also intend to poll Rick Boucher's district in SW Virginia sometime between now and Christmas to see if a similar situation exists there. It's a commonly accepted fact that Congressional Democrats are unpopular but Congressional Republicans are even more unpopular. That's true but it shouldn't be taken as an indication that Democrats are going to be fine in 2010 because there's a pretty significant group of the electorate that dislikes both parties and they're overwhelmingly planning to vote Republican next year because they think it at least provides an opportunity for change. Arkansas' 2nd Congressional District is a good example of this. 16% of voters there don't like the Democrats or the Republicans. But they give all three of Democratic Congressman Vic Snyder's potential opponents leads of 37-40 points and they give the possible Blanche Lincoln foes we tested leads of 42-43 points. There are very few people who dislike Congressional Democrats planning to vote for them this year anyway. But there are a fair number of people who dislike Congressional Republicans who are still planning to give them a chance. One other thing to keep in mind when talking about the fact that Republicans are more unpopular than Democrats is that GOP voters are more likely to give their own party bad marks than Dems are- but they'll still vote for it. On our last national poll 45% of GOP voters expressed disapproval of their party while only 16% of Democrats did. This may seem counter intuitive but the news that Bob Etheridge is not running for the Senate is good news for Democrats. At this point the chances of a Republican taking over his open Congressional seat are better than the chances of his beating Richard Burr would have been. The political climate may turn around for Democrats by this time next year, and if it does I'm confident whoever the party's nominee is will have a very good chance of beating Richard Burr. But as things stand today an Etheridge candidacy was not worth the risk of losing his House seat. I don't think 2010 is going to be a good year for Democratic politicians to gamble. We're going to be releasing polling looking at both the House race and the Senate race in Arkansas-2 next week. That leads to an obvious question: why AR-2? It's a district where there hasn't been a real strong challenge to Democratic Congressman Vic Snyder in a while. But it also voted for John McCain by a good margin last year, and unlike many Dems in districts as conservative as Snyder's, he voted for the health care bill in the House last weekend. So his district is a good test case of whether the political climate for Democrats is so bad right now that incumbents in McCain districts are vulnerable next year even if they haven't had a tough fight in a really long time. -55% of voters in the district are opposed to the health care bill passed Saturday night with 32% in support. -Voters in the district, like voters everywhere, hate both Congressional Democrats and Congressional Republicans. For Dems the favorability breakdown is 36/54 and for the GOP it's not much better at 32/48. -50% of voters in the district think Congressional Democrats are too liberal...but 39% also think that Congressional Republicans are too conservative. Barack Obama's approval rating in North Carolina is headed in the right direction this month. An equal 47% of the state's voters approve and disapprove of his job performance after PPP's monthly surveys from August through October had found his numbers in the red. Obama's climb in our numbers matches a recent Civitas finding that his approval had improved to 50/48 from 44/53 in its previous poll. In addition to asking Obama's straight approval this month we also had respondents give him a letter grade. Reflecting the extent to which most Americans either really love or really hate Obama, 61% gave him either an A or an F, with 32% giving him the highest grade and 29% the lowest. His 'GPA' with North Carolina voters comes out at 2.1, or somewhere between a C and a C+. This improvement in Obama's standing means that a year after he took the state in the Presidential race by the smallest of margins he is in more or less the exact same position now that he was then. North Carolinians are evenly divided in their feelings about Obama and if he had to stand before the voters in the state again today it would probably be just as close as it was last year. Looking at Obama's standing with various groups of the electorate you also find little movement from who supported him at the polls a year ago. He is popular with liberal, moderates, women, African Americans, young voters, and those in the Triangle and metro Charlotte. He is unpopular with conservatives, men, whites, senior citizens, and folks in the Triad and the mountains. Most North Carolinians made up their minds about Obama more than a year ago, and few are changing them.